I hope everyone has had a good weekend? We spent the weekend at The Good Food Show at the NEC and since this is scheduled as I am writing this on the train I will tell you all about it in a blog post. 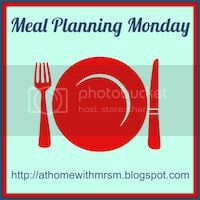 This week for me will be a short meal planning week as on Friday like so many others I will be a BritMums Live and please come and say hi, I don't bite. I know I know it's been a few weeks since I last took part and that is mainly due to various members of the family being ill, both the girls have had chickenpox over the last month and we've all had the flu and then last week we were away at Butlins...but now I am back. As the girls are getting older we are now trying to have meals where we all eat the same. It's not going to bad and they seem willing to try new things which makes it a lot easier at dinnertime. It's maybe not the most adventurous menu but most of it the girls have asked for so fingers crossed they eat it all up. I can't wait till the salad bits we can actually get out of the garden rather than having to buy it.